Good evening my fellow Gentoo users. I just upgraded my kernel and now I cannot connect to my wireless network. Connection via the ethernet port works fine. Here is the kernel version I have upgraded to. ifconfig shows that my wireless interface is up. Here is the model of the wifi controller. The laptop have a wifi kill switch but is switch so that the wifi is turned on. For some reason I can connect to the network when I boot with the older kernel (gentoo-sources 3.10.17) but not with this new kernel so I believe the problem lies with me not enabling something in the kernel but I am unsure of what that could be. Can someone please help me with this? edit: I just realized I posted output from the older kernel not the newer one that I am having issues with. Here is the correct output. as you can see the firmware is being loaded. please note the update to dmesg output above. Not much there to show why the connection is failing, you should really provide some wpa_supplicant logs, dmesg (of the auth), and details of the AP your attempting to connect to. First thing I'd do is disable 'N' on the AP (select 'G only') this way you may get some idea of why the connection is failing (and as I see a lot of issues with N, my guess would be the issue is there). Attempt to connect then pastebin the log ... '-dd' or '-ddd' for greater level of debug. <3 ... 1 should be the AP you're attempting to connect to, 2 seems to have been run prior to connection, and 3 won't exist as wicd doesn't use /etc/conf.d/net. Anyhow, as you're using wicd is CONFIG_CFG80211_WEXT enabled? It will be required as wicd doesn't use the new NL80211/CFG80211, but WEXT (the now legacy "wireless extentions"). If by "AP" you are referring to the router that I am trying to connect to then that is what I did. And that output is what I was given. I think so, in the wicd gui the driver selected is WEXT not NL80211 and there is no option for CFG80211. Although I do believe that the issue is due to something in the kernel as wicd seems to work when I boot to my older kernel but not when I boot to the new kernel. <3 ... CONFIG_CFG80211_WEXT is a kernel option, it provides the WEXT compatibilty layer for NL80211. wicd will require it enabled as it uses (the now legacy) WEXT exclusively. As for the output above, besides the ESSID being obfusticated there is more than one ESSID, so I can't tell which is the one I should focus on ... and the dmesg doesn't show any authentication, so nothing is happening (wicd probably does nothing as no WEXT is available). Oh I'm sorry I misunderstood you. Yes CONFIG_CFG80211_WEXT is compiled into the kernel. So can someone help me with this? get wpa_supplicant to associate+auth to the AP (aka "your wireless router"), square that away, and then tackle wicd. If wpa_supplicant can't connect, then neither can wicd. run wpa_supplicant from the command-line, following the instructions listed in the wiki charles17 linked above. It should spit out meaningful output that will point you/us in the right direction. dump said output on pastebin, and link away. 2015/01/06 01:57:00 :: Couldn't detect a wired interface. According to cach0rr0 wicd depends on a working wpa_supplicant. So I suggest you first make wpa_supplicant working and in the next step care for wicd. Did you work through the testing section https://wiki.gentoo.org/wiki/Wifi#Testing? And, please use http://pastebin.com/ instead of posting such big output as above. 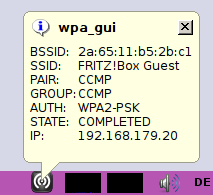 wpa_gui says it is connected but when I try to browse the web the browser says unable to connect. Using wicd everything is fine. So I am confused. to start the wpa_supplicant gui. So it looks http://ibin.co/1nPlE5qlegYO like you didn't receive an IP address. In most cases re-entering the password aka PSK in wpa_gui might help. If not: Does your AP provide DHCP or are you using static IP address? I don't think that's a good idea, see the "important" in http://i.imgur.com/Bsu1Tez.png. In most cases re-entering the password aka PSK in wpa_gui might help. If not: Does your AP provide DHCP or are you using static IP address? As you say you were using wicd and wicd works fine, what's your problem then?